Hyaluronic Acid Moisturizing Cream 4 oz CreamIngredientsPurified Water, Restorative Hydration Complex Vitis Vinifera (Grape) Seed Oil, Glycine Soja (Soybean) Oil (and) Chamomilla Recutita (Matricaria) Flower Extract, Olea Europaea (Olive) Fruit Oil, Aloe Barbadensis Leaf Extract, Sodium Hyaluronate, Camellia Sinensis (Green Tea) Extract, Caprylic/Capric/Myristic/Stearic Triglycerides, Cetearyl Olivate (and) Sorbitan Olivate, Glycerin, Sodium Ascorbyl Phosphate (Vitamin C), Panthenol (Vitamin B5), Dimethicone, Diazolidinyl Urea (and) Iodopropynyl Butylcarbamate, Sodium Magnesium Silicate, Bisabolol, Citric Acid, DAlpha Tocopherol (Natural Vitamin E), Disodium EDTA, Retinyl Palmitate (Vitamin A).DescriptionFor youthful, healthy-looking skin, Hyaluronic Acid Moisturizing Cream with Restorative Hydration Complex can help. Hyaluronic Acid is naturally found in the skin, where it helps to maintain elasticity by trapping moisture, which in turn may smooth the appearance of wrinkles. 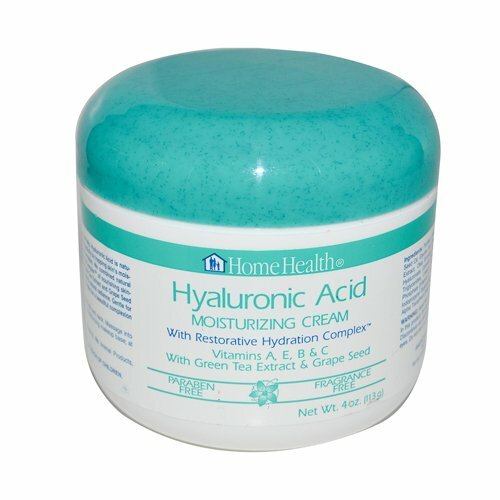 Home Health’s Hyaluronic Acid Moisturizing Cream has a specially formulated blend of nourishing ingredients including Retinol, plus the antioxidant protection of Green Tea and Vitamin C. Gentle yet effective, this paraben-free, fragrance-free cream absorbs quickly into the delicate areas of the skin surrounding the neck and face for a beautiful complexion that truly radiates. 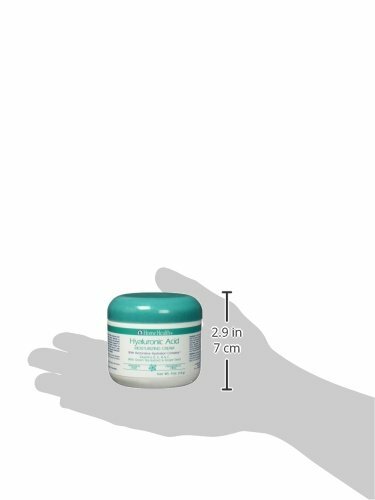 Hyaluronic Acid Moisturizing Cream contains no mineral oil, petroleum, animal products. Free of parabens, artificial fragrances, artificial colors.